Menominee County vital records from October 1907 to the present can be ordered by mail, fax, or in person from the Vital Records Office of the Wisconsin Health Department in Madison, and online through VitalChek. Uncertified copies are unrestricted and cost $20. Records are also available locally: records prior to 1961 can be ordered from the Register of Deeds in Shawano, with records after 1961 available from the Register of Deeds in Keshena. Vital records for all years are also available from the Menominee Tribal Office in Keshena. 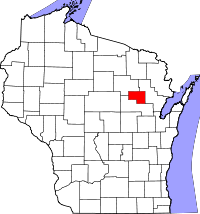 Menominee County, primarily lands of the Menominee Indian Reservation, was formed in 1959.